Man Behind Lens: Olympus OM-D Preorder Promotion ?!! 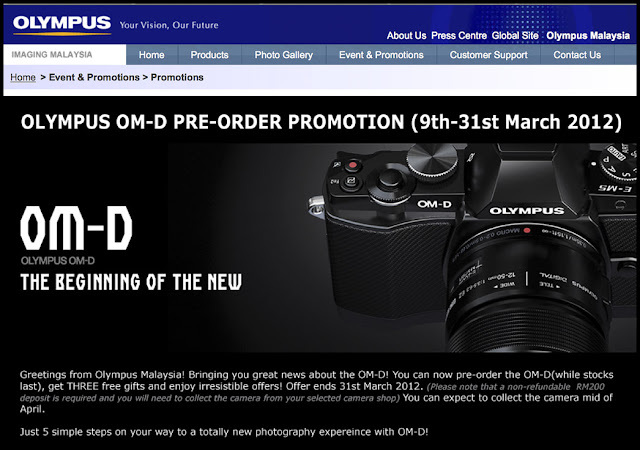 Olympus OM-D Preorder Promotion ?!! 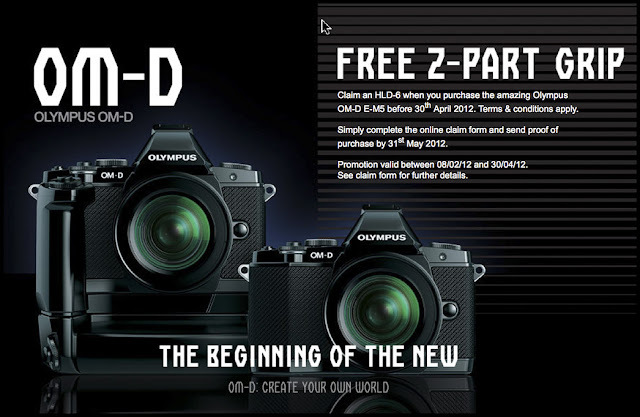 I read with interest that Olympus Malaysia is holding a Pre-Order Promotion for the new OM-D EM-5 camera. For a deposit of Rm 200.00 you can pre-order this beauty and Olympus Malaysia will throw in some freebies too! Well, yours truly was ecstatic and was going to call his friend in KL to book one for him! He DO NOT care about all those freebies but he really wanted a HL-D6 battery holder / grip! He found out Olympus Malaysia is selling that for a very special price of Rm 899.00 (Rm 999.00 usual price) during this promo! Yours truly suddenly remember that he read somewhere, the same HL-D6 is being given out FREE till end of April; if you pre-order an OM-D! It was in U.K.! With the blessing of Olympus U.K., you can pre-order the same camera from Amazon UK before end of April and get a FREE HLD-6 grip!! But.... but... but... photo equipment are ALWAYS much, much more expensive in UK than Malaysia; EVERYBODY knew that! Come on Olympus Malaysia, YOU CAN DO BETTER THAN THAT! Why I Want A Olympus OM-D E-M5! Olympus OM-D, Retro Out Of Control? Hi! I came across your blog while googling micro four-3rd camera [ broke mt camera last weekend so I'm now desperately hunting for a new one :( ]. I must say I really enjoy reading your entries [it's not everyday I came across a photography guru blog ]:) I got a question if you don't mind. I'm really interested with the wide lens you are using, Pan VARIO 7-14 mm. I'm thinking to buy that with a Panasonic body. I just wonder is there any particular reason you prefer olympus body over Panasonic? [ or please correct my if my assumption is wrong ]. Hi Fiziskandarz.. Glad you like my blog. Re why I prefer Oly body, I did mentioned that in my post on the Vario 7-14. Reason: Panasonic's stabilizer are lens based,not the 7-14 though. Olympus put their stabilizer IN THE CAMERA,that enable me to shoot as low as 1/4 sec with my Pan 7-14! The new ON-D's stabilizer is even better! Can't wait to get one! !